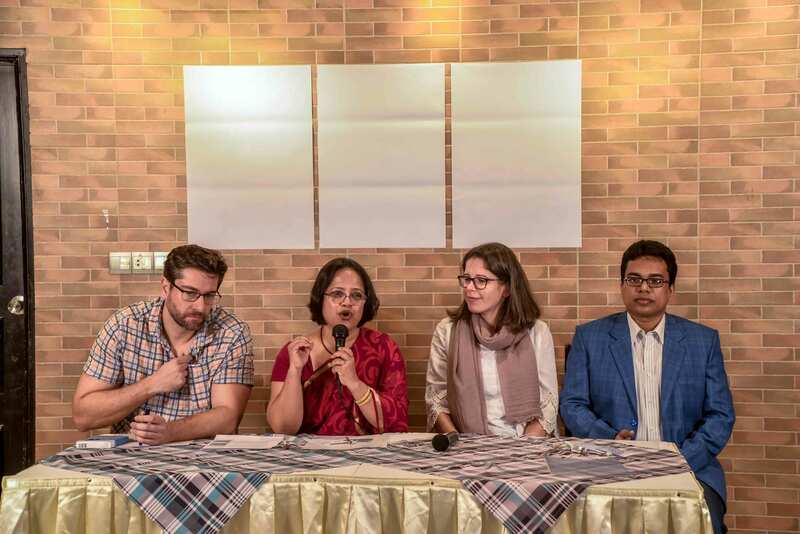 RMMRU organized a press conference to share Annual Migration Trends Report 2018 on 23 December 2018 at the National Press Club, Dhaka. 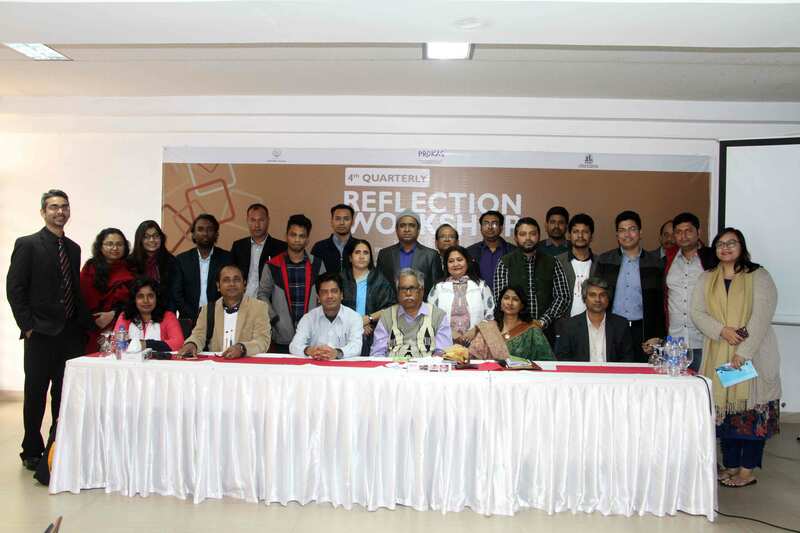 The press conference was chaired by Dr. Shahdeen Malik, Senior Advocate, Bangladesh Supreme Court and Chair of RMMRU. The report was presented by Dr. Tasneem Siddiqui, Founding Chair, RMMRU and Professor, Department of Political Science, University of Dhaka. 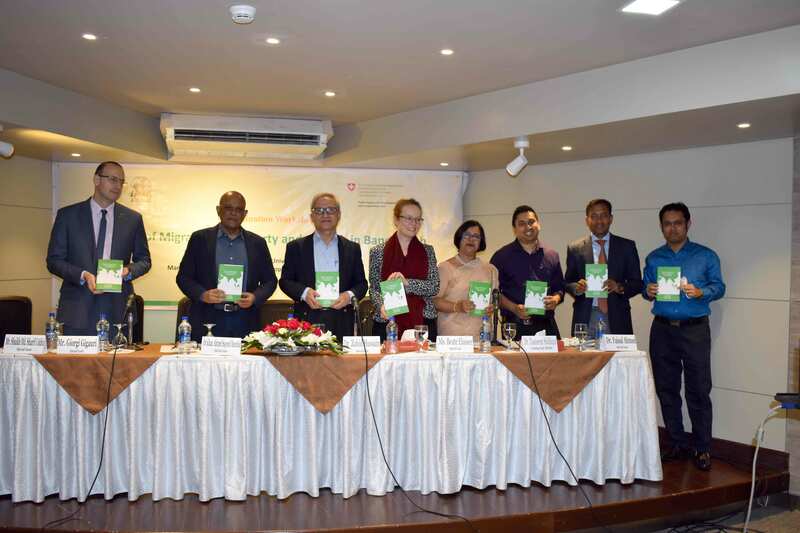 The report was presented in seven sections: labour migration trends in 2018, important issues pertaining to labour migration, service providing agencies, Bangladesh in international arena, civil society initiatives, new knowledge on migration and recommendations. 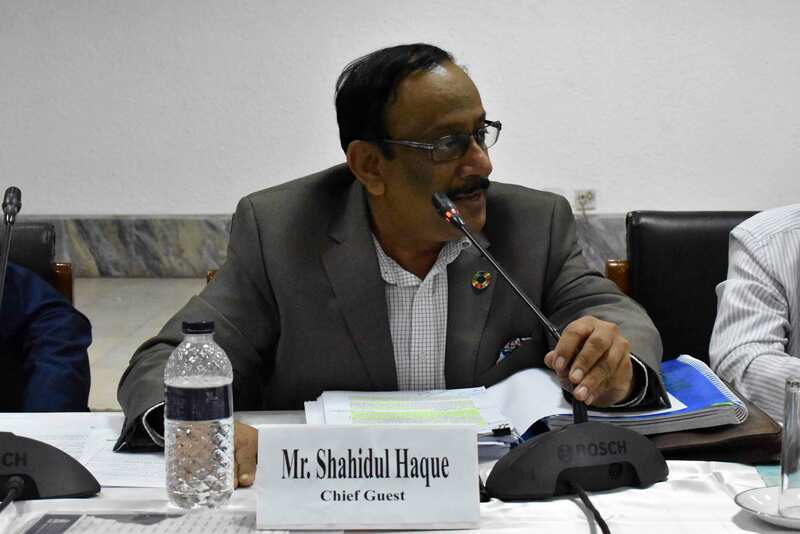 Unveiling the report Dr. Siddiqui said that up to October 2018 a total of 6,14,585 Bangladeshi workers migrated to the Gulf, South East Asia and other destination countries. If this trend continues for rest of the year the flow of migration will reduce by 27% this year. The rate of female migrants has also come down in 20.03% than 2017. The findings also inform that 21% of the total migrants are returnee migrants and the rest 79% are staying abroad. It is high time to prepare database on returnee migrants. Dr. Siddiqui added Migrant workers meet 30 per cent of their migration cost by selling property and the rest by borrowing from their relatives. In their election manifestos the major political parties have highlighted on expatriates’ rights specially their voting rights. But there is no proper indication from any party how they are going to improve the condition of the migrants who contribute the most to our national economy. In 2017 a total of US$1353 crore was received as remittances. The figure is expected to reach US$1564 crore marking an increase of 15 percent. Dr. Shahdeen Malik said that exploitation of female migrants is a sensitive issue as women are most vulnerable to abuse in countries like Saudi Arabia and are not treated with dignity and honor. The report was contributed by RMMRU team including Dr. Tasneem Siddiqui, Ms. Marina Sultana and Rabeya Nasrin. 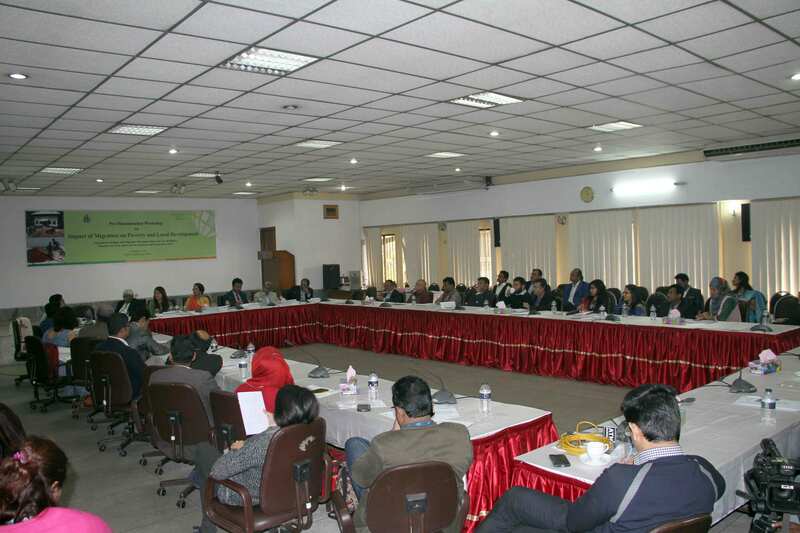 About 80 journalists from different electronic and print media were present at the conference. Below please find the links to the coverage of the press conference. The Perspective Gathering Workshop for Ensuring Inclusive Urban cities was jointly organized by Refugee and Migratory Movements Research Unit and University of Exeter on 23 November 2018 at Conference Hall of Well Park Residence Boutique Hotel and Suits. The objective of the workshop was to support the process of building empathy between migrants and city planners by creating space for participants to understand each other’s perspective. In this programme, there were present city planners from City Corporation and Chattogram Development Authority and migrants coming from different parts of the country including ethnic people from CHT. During the workshop, both city planners and migrants have presented and explained their three selected photos captured by them relating to human security and well-being of city dwellers in Chattogram. 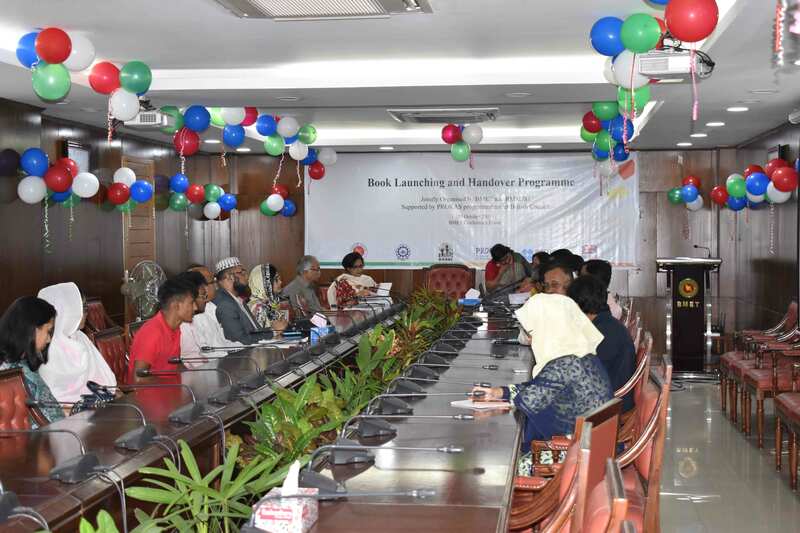 The book launching and dissemination workshop on the second Wave of the panel research ‘Impact of Migration on Poverty and Growth in Bangladesh’ was organized by Refugee and Migratory Movements Research Unit (RMMRU) on 30 October, 2018 at BRAC Centre Inn. RMMRU conducted both the rounds of this panel survey with the support of the Swiss Agency for Development and Cooperation (SDC). 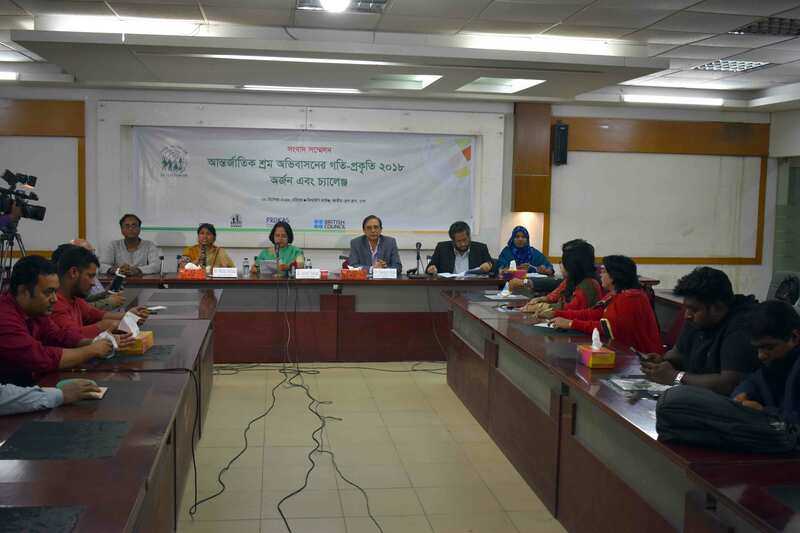 Professor Tasneem Siddiqui, Dr. Ananta Neelim, Dr. Chowdhury Rashaad Shabab and Mr. Mahmudol Hasan Rocky conducted the research on 6143 households of 20 districts of Bangladesh. The study was initiated in 2014 with a view to generate a panel survey over a period of ten years revising the same households at three years of interval. The aim of the dissemination workshop was to share the research findings with government, academics, development practitioners and media with a view to employing the outputs of this micro level evidence based research into migration governance mechanism. Professor C.R. Abrar, the Executive Director of RMMRU moderated the inaugural session. Lead Economist of World Bank Dr. Zahid Hussain, Director General of Bangladesh Institute of Development Studies (BIDS) Dr. KAS Murshid, IOM Chief of Mission in Bangladesh Mr. Giorgi Gigauri, Chief Economist of Bangladesh Bank Dr. Faisal Ahmed and Director of Cooperation, SDC Ms. Beate Elsasser attended as Special Guests to the programme. Sheikh Md. Sharifuddin, Deputy Chief, represented the Ministry of Expatriates’ Welfare and Overseas Employment to the dissemination workshop. 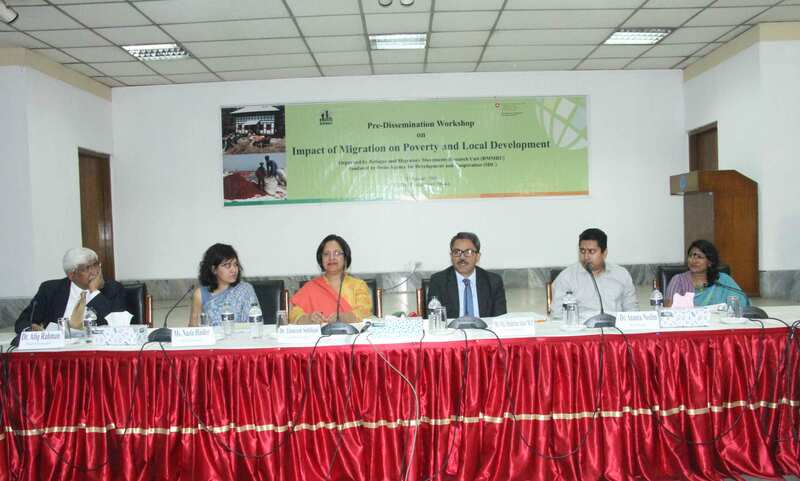 The SDC and RMMRU book ‘Impact of Migration on Poverty and Growth in Bangladesh’ was launched at this session. 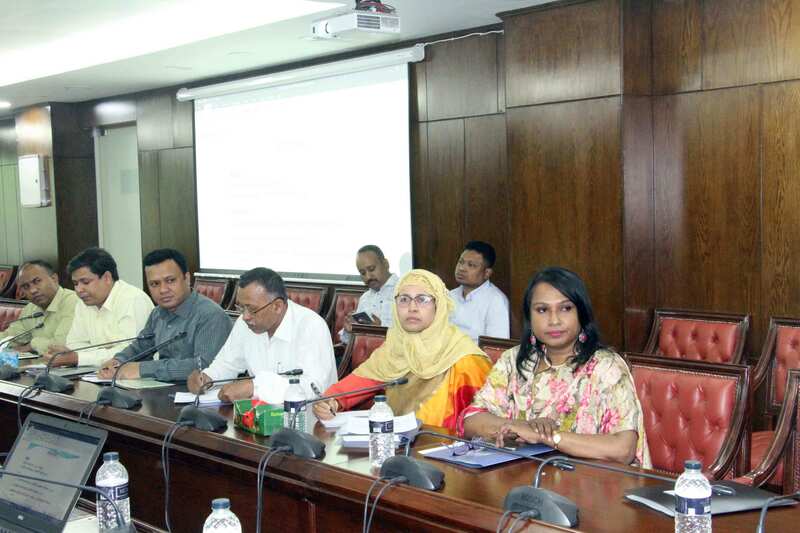 Dr. Fahmida Khatun, Executive Director of CPD, Dr. Selim Raihan, Professor of Economics and Executive Director of SANEM, and Dr. Nurul Islam, the Director of BMET discussed on the research findings and provided valuable insights. 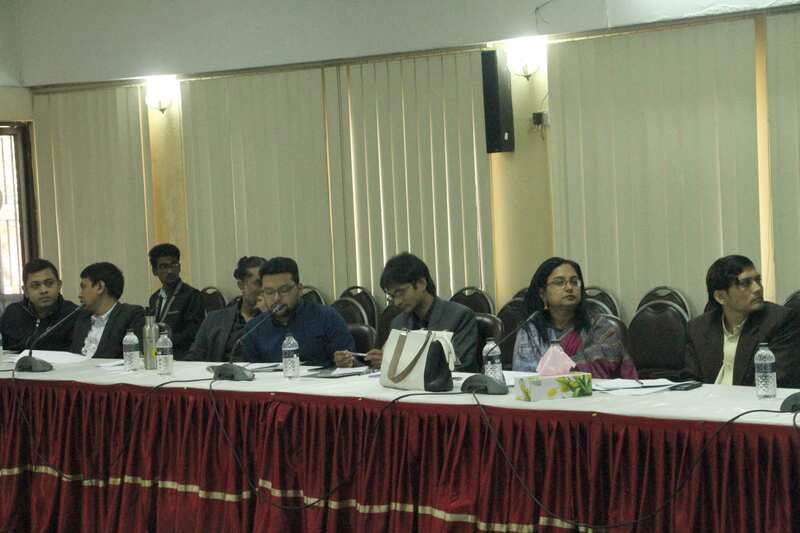 Executive Director of TIB, Dr. Iftekharuzzaman, Director of ICCAD, Dr. Saleemul Huq, CEO of UCEP Bangladesh, Ms. Tahsinah Ahmed were also present at the workshop along with the esteemed guests. 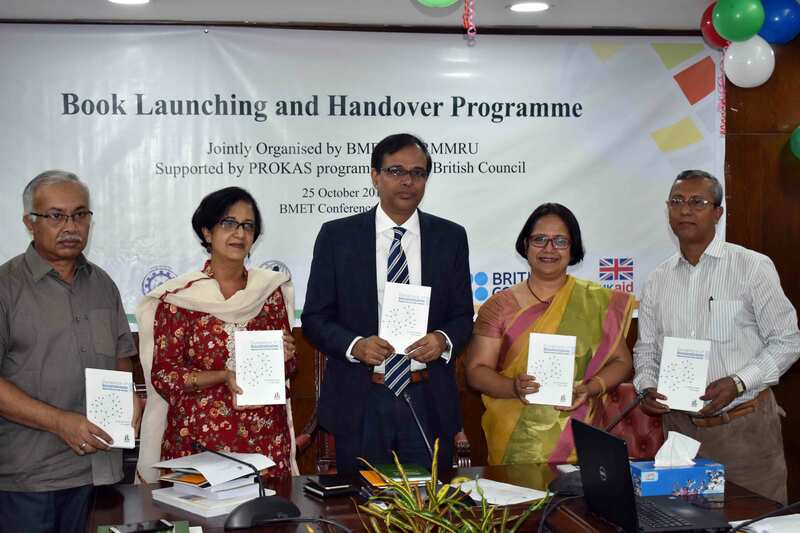 RMMRU launched a set of publications on migration mediation titled ‘Justice at the Door Steps: Mediation on Migration Fraudulence’; ‘Migration Dispute Mediation Manual’ and ‘Dynamics of Decentralization: Migration Services under Spotlight’and handover to DG, BMET on 25th October 2018 at BMET conference room. 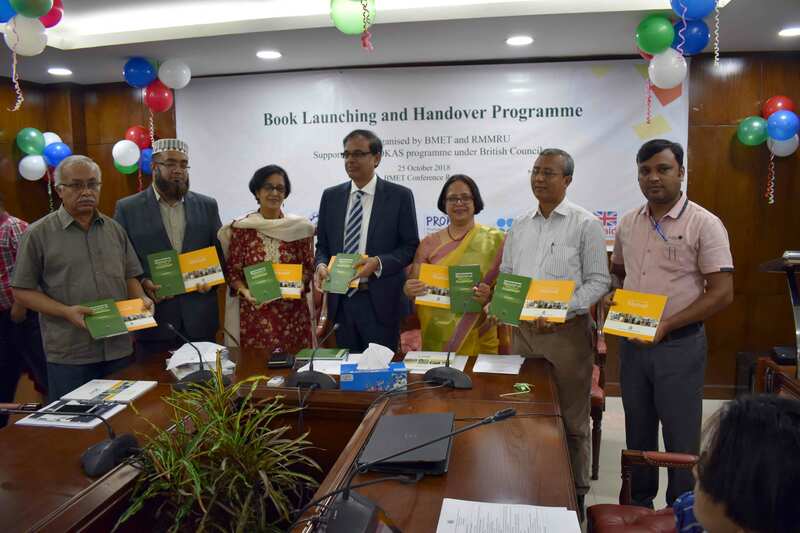 The Book Launching event was moderated by Dr.Tasneem Siddiqui, Founder Chair of RMMRU and on behalf of RMMRU She handover the Mediation Publication Model to Mr.Selim Reza, DG, BMET in presence of Mr.SM Rafiqul Islam, ADG (Training), Mr. Nurul Islam, Director(Training operations) BMET with other senior officials of BMET. Mr. Md. ZafrulHasan, Director(Senior District Judge), National Legal Aid Services Organizationand Mr. Shaikh Md. Sharif Uddin, Deputy Chief (MoEWOE), Representative from BAIRA, Representative from BOESL and representatives from different national and international organization were present there. Dr. SumaiyaKhair, Professor, Department of Law, University of Dhaka and Treasurer RMMRU and also the author of the book introduced the book to participants.Ms. Shirin Lira, IBP Manager, Gender and Inclusion Advisor from PROKAS also present in the Book launching event as a special guest. BMET works to resolve many crucial problems through arbitration at the people’s doorsteps.RMMRU also exercise a mediation process in community level which I found very effective and I like to replicate the model, developed by RMMRU and applying in the field. I like to request RMMRU for organizing capacity development training for DEMO officers to ensure effective arbitration process to get solid output by means of recovering money. I thought that the book would play an important role in resolving migrant problems in mediation at the doorsteps. 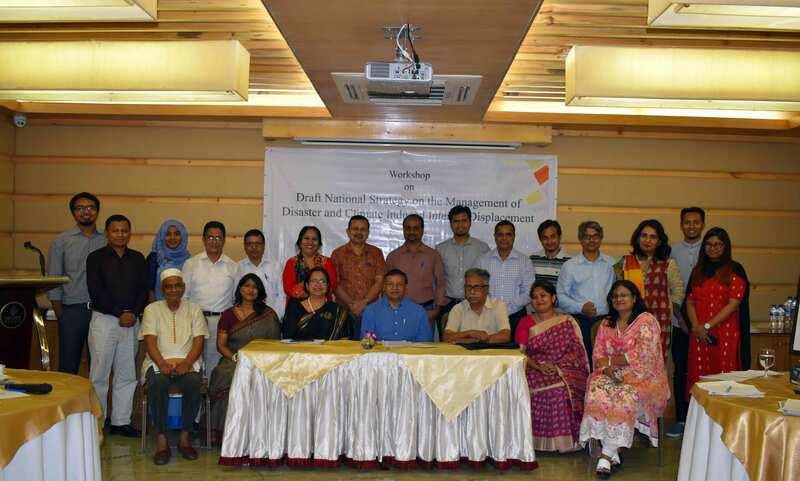 RMMRU organized a half-day workshop on National Strategy on the Management of Disaster and climate Induced Internal Displacement (NSMDCIID) funded by PROKAS on 23rd September 2018 at Ascott the Residence, Gulshan. 24 experts and representatives from IBP members participated in the workshop. Mr. Saleemul Haq chaired the workshop where Dr.Tasneem Siddiqui, Founder Chair of RMMRU presented the Key papers. Climate migration we are seeing today may or may not be climate migration unless we have very good evidence to show that it is because of climate change. 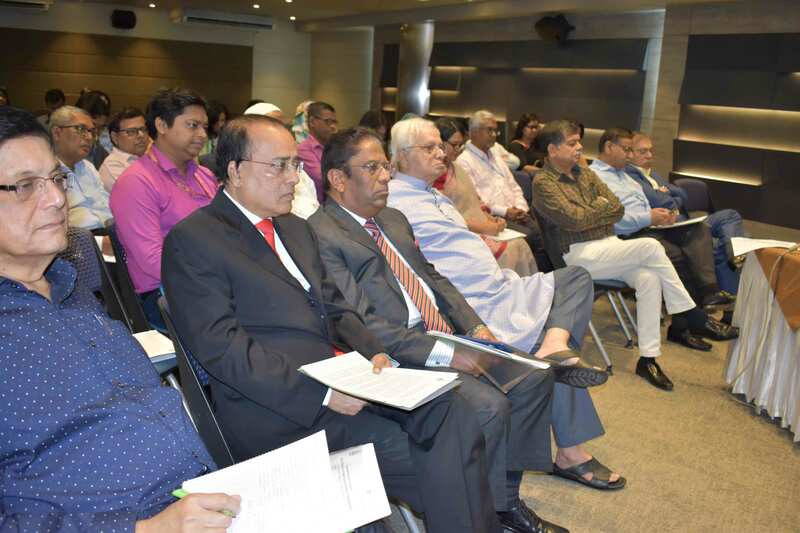 He expected to utilize all sorts of personal and networking to formally present the draft to the government that has been done with vital contribution from RMMRU. 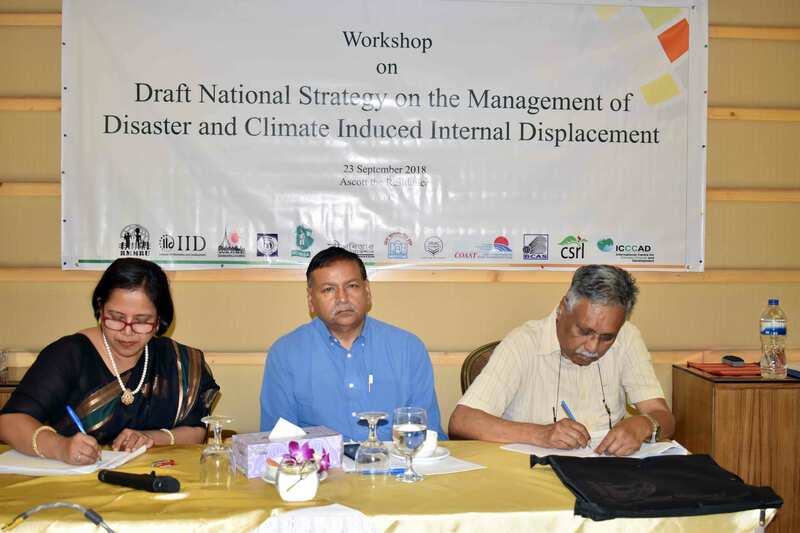 RMMRU already has worked on it to make a policy on internally displace migrants because of climate change from Bangladesh with the help of Bangladesh government and Ministry of Disaster Management and Relief (MoDMR). But this work does not run because of changing of related people of government office. It is the right time to push government regarding the issue for future using sources of contact, network because it is an important topic. He also acknowledged the nice work of RMMRU as a PROKAS partner and hoped to work through collaboration with RMMRU and PROKAS other partners on the issue. If we think about the displacement of climate vulnerable people, we have to go forward following the future projection of climate change. We have to be careful about the projection which timeline we are going to reach. We need to focus on adaptation due to climate change. Riverbank erosion should a prime concern in permanent displacement and some functional solution. 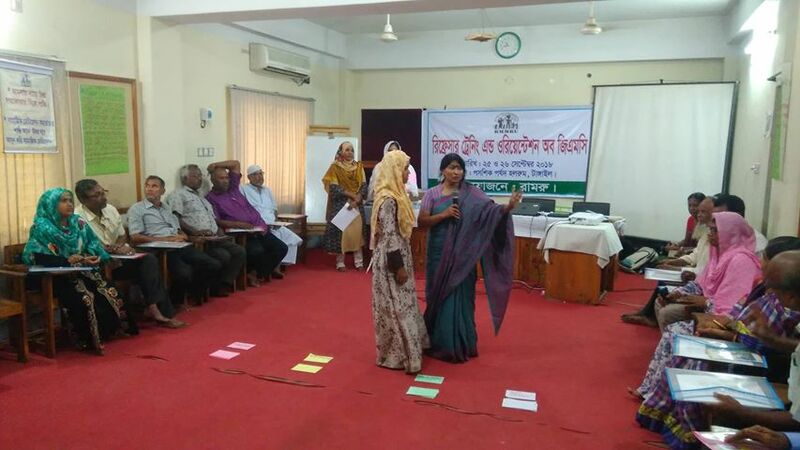 Refugee and Migratory Movements Research Unit (RMMRU) organized two days long training on “Refresher Training and Orientation on Safe Migration and Migration Act 2013 of GMC” at Proshoshik Porshod, Tangail on 25 and 26th September 2018. 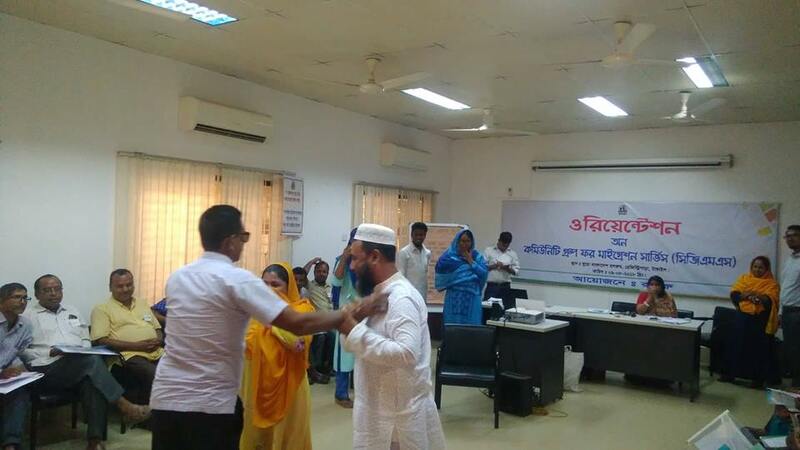 The main purpose of this training was Building Capacity of Grievance Management Committee for Conducting and develop their knowledge, providing information about safe migration and migration services and make them responsible to own the structure of mediation and make the system sustainable involving community people. The total participants of this programme were 68. Among them 49 were male and 19 were female. All members of RMMRU Mediation Advisory Group, members of RMMRU Migration Mediation Committee (RMMC) and Youth Volunteer Group participated in this training. Affected migrants also present there to share their experience.Ms. Marina Sultana, Director, Programme moderated the training programme. Mr. Karatik Chadra Debnath, AD of DEMO, Mr. Kamruzzaman, and principal, TTC, Kazi Golam Ahad, District Information Officer, Md. Abdul Karim, Assistant Commissioner, and Executive Magistrate were present as resource persons. 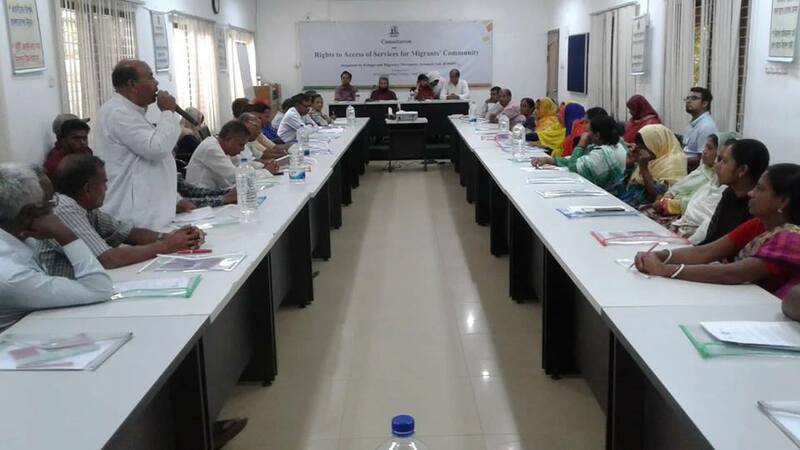 Mr. Kartik Chandra Debnath, AD, DEMO, Tangail acknowledged the activities of RMMRU and said DEMO is always ready to provide services to migrants at a community level. He pointed that DEMO, TTC, and RMMRU all are working together actively to ensure the access of services to migrant’s community and provide information to community people of safe migration. 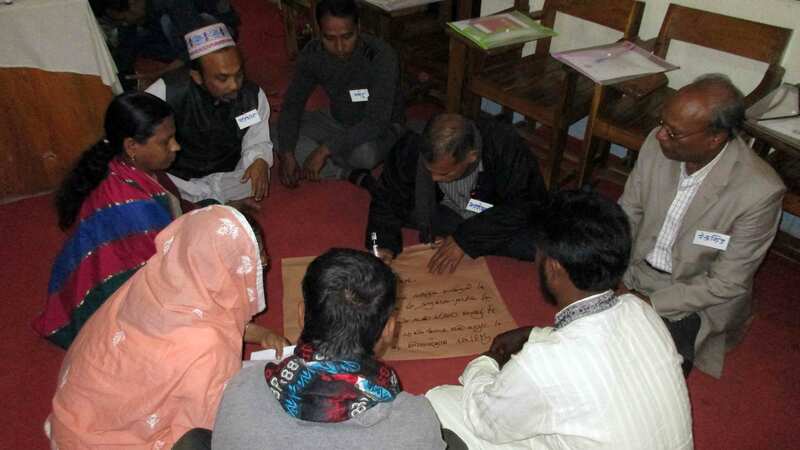 RMMRU is piloting the community Group for Migration Services( CGMS) at two unions on Tangail Sadar, Tangail. The aim of formation of these two groups are ensuring the access of services in a faster way, reducing the risk of fraudulence, supporting decentralization services of government and connecting community people with BMET, DEMO, TTC etc. It will be a platform to build up network among grassroots people and government. 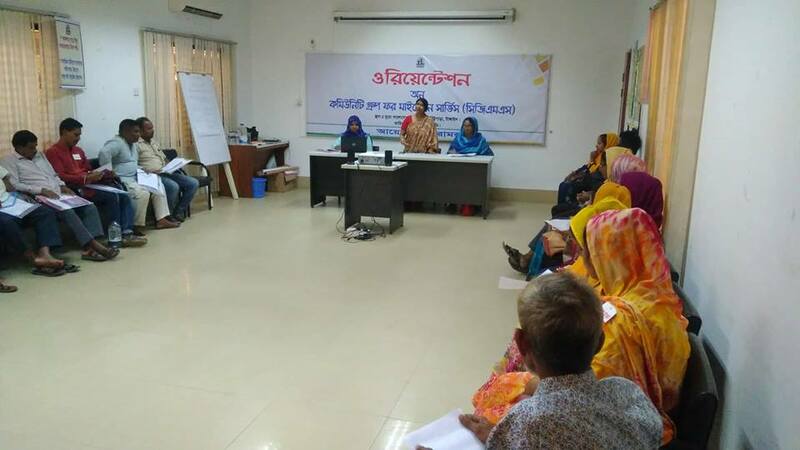 For enhance their capacity RMMRU organized an orientation programme for Community Group for Migration Services on 9 August 2018 at BURO Bangladesh Training Centre. Marina Sultana Director Programme, RMMRU moderated the training. She introduces RMMRU briefly including its policy, contribution and objectives etc. 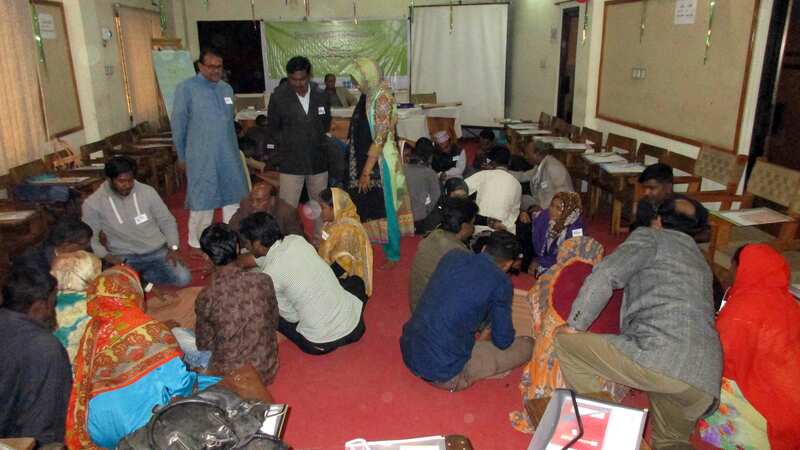 The participants of the training were 26 members of CGMS from two working areas of Tangail. Among them 6 members were women rest were male members. 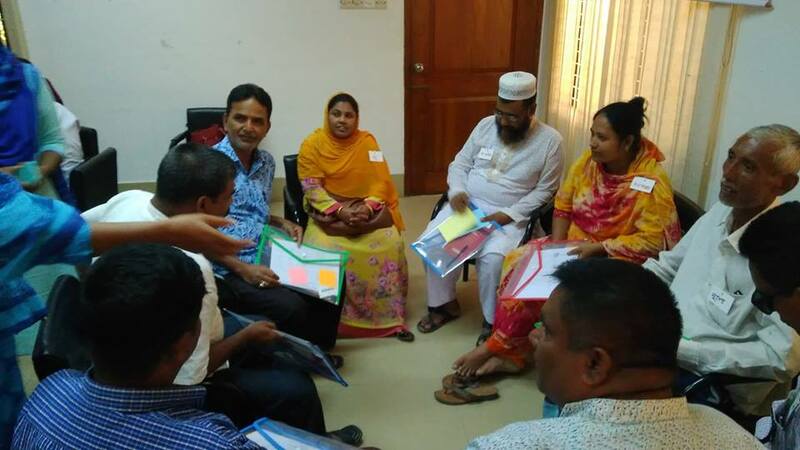 RMMRU organized a consultation on Rights to Access of Services for Migrants’ Community on 8 August 2018 at BURO Bangladesh Training Centre, Tangail. 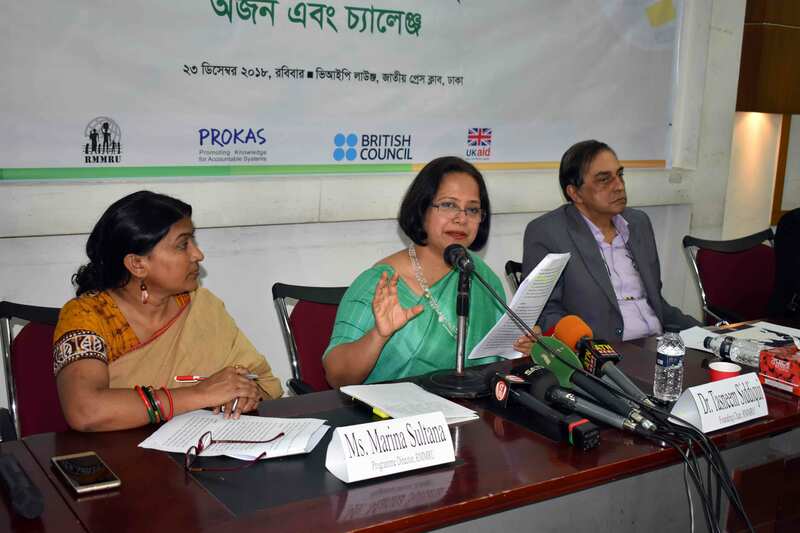 Marina Sultana Director Programme moderated and Mr. Golam Ahad, District Information officer chaired the consultation. Muhammed Naser Uddin Jewel, ADC General, Tangail enriched the programme as chief guest. 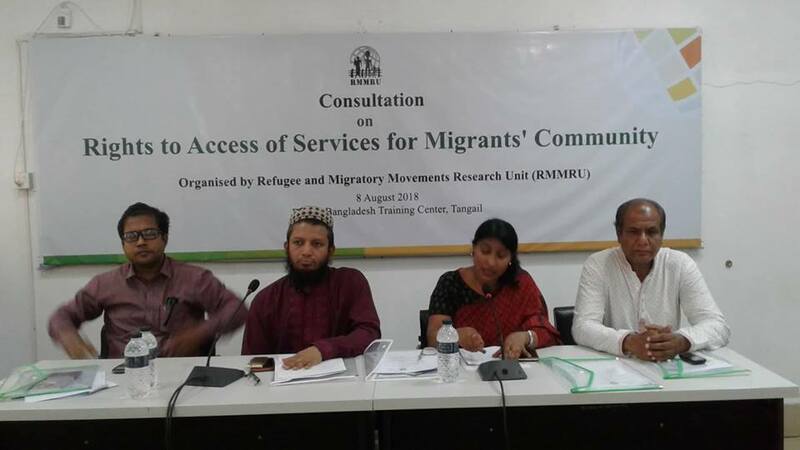 During this session Nazma Akhter, Field Coordinator introduces Community Group for Migration Services (CGMS). 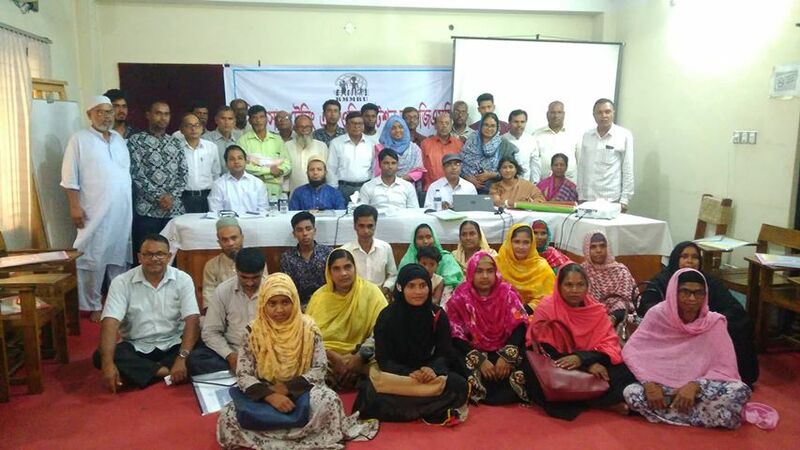 Total 50 participants including DC office, DEMO, TTC and CGMS Members, RMRMU Migration Mediation Committee, representative of local NGOS, journalist and others were present in the programme including 19 female participants. 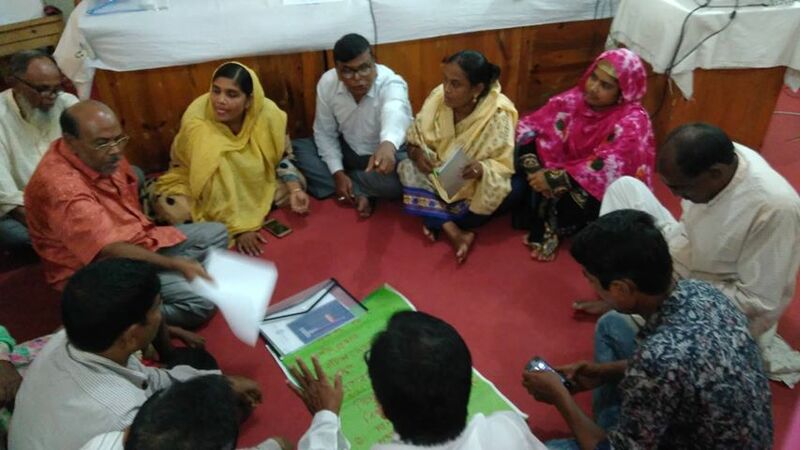 Mr. Kartik Chandra Debnath, AD, DEMO, Tangail appreciated the consultation for connecting the community people and government. He pointed that DEMO, TTC and RMMRU all are working together actively to ensure the access of services to migrant’s community and provide information to community people of safe migration. Mr. Kamrujjaman, Principal, TTC pointed out the importance of TTC. He stated that we need more skill manpower to acquire more remittances. He also said “our collective action will promote good governance in migration Sector. 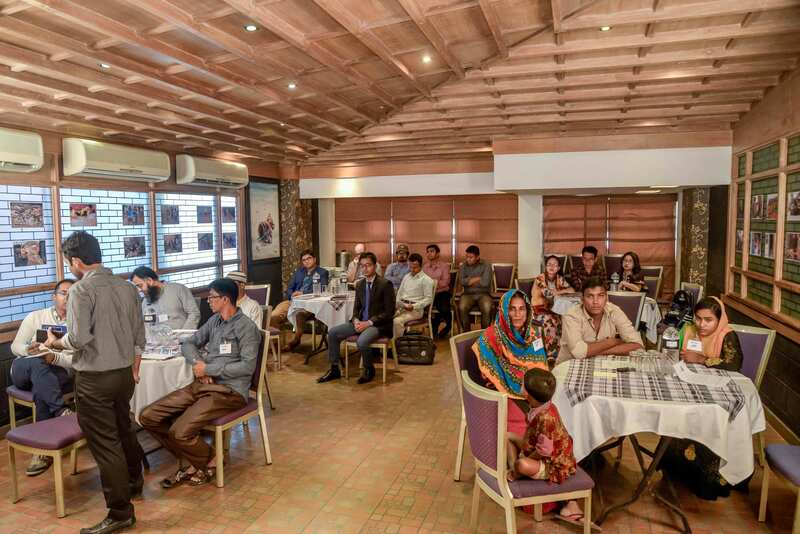 I am personally thankful to RMMRU for playing major contributing role in this sector and supporting government to disseminate information and encouraging decentralization process of government by forming such committees in grassroots level who will connect community people to government and vice versa." 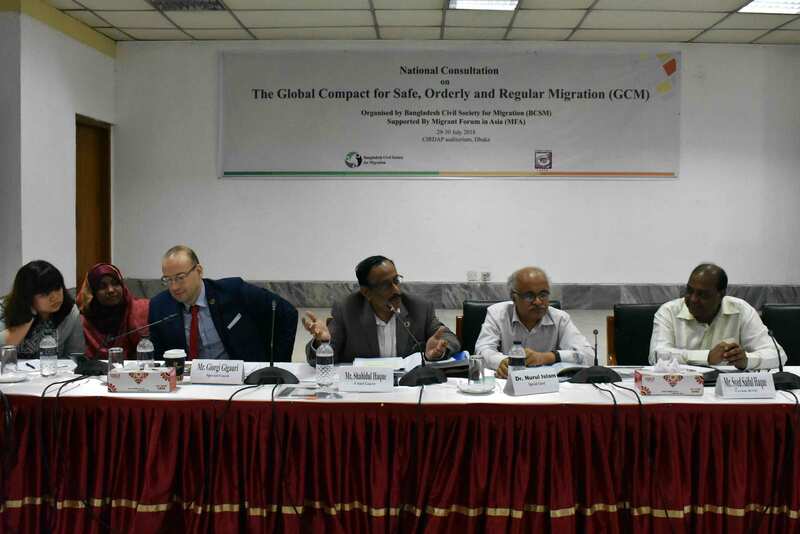 Bangladesh Civil Society for Migration (BCSM), in collaboration with the Migrant Forum in Asia (MFA) organized two day national consultation on “Implementation of the Global Compact for Migration” at the CIRDAP auditorium, from July 29-30, 2018. The objective of this consultation is to engage migrants’ stakeholders on GCM issue and to have strategic collaboration in addressing migration issues with a human rights-based approach within and beyond the GCM, 2030 Agenda for Sustainable Development, as well as national and sub-regional processes. Opening session of this consultation is moderated by Ms Marina Sultana, Director, Programme, RMMRU. Mr. Syed Saiful Haque, Co Chair, Bangladesh Civil Society for Migration (BCSM) and Ms. Alexis Nadine Bautista , Migrant Forum in Asia provided the welcome remarks. The Chief Guest was Ms. Hosne Ara Lutfa Dalia, MP, Co-Chair, Bangladesh Parliamentary Caucus on Migration and Development. In plenary session Ms. Jasiya Khatun, Director, WARBE, provided presentation on Global Compact for Safe, Orderly and Regular Migration, Migration and 2030 Agenda for Sustainable Development by Mr. Shakirul Islam, Chairman, OKUP and Different national processes around implementation of GCM by Ms. Sarowat Binte Islam, Senior Programme Manager, MJF. The most important part of first day consultation was issue based group work to set recommendations and BCSM National Strategy on the Implementation of the GCM. Dr. Md. Nurul Islam, Director, BMET was present as the special guest and suggested to form a committee like the SGD committee for CGM. He said that “In most cases we see that the migrants don’t say about the extra money that they pay to migrate but disclose when they fall in fraudulence. 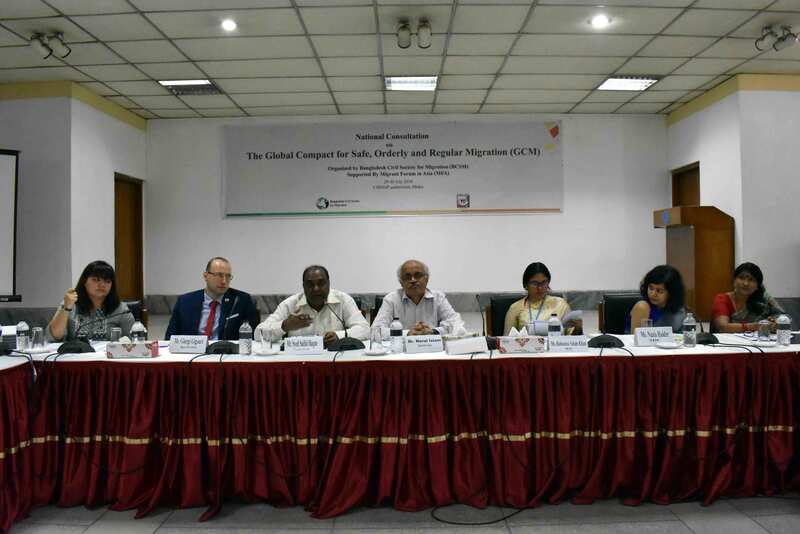 So, there is no alternative of awareness building of the migrants” Speaking as the Chief Guest Mr. Shahidul Haque, Honourable Secretary, Ministry of Foreign Affairs stated that “Civil society may play a vital role to ensure justice, rights and good governance in migration sector. Now it is a golden opportunity for IOM to play part in GCM like UNHCR does for the refugees. He said about the one review forum (not two) should be formed. He added that the destination countries always tend to be in the benefited side. So, it is needed to make international laws or to create pressure on them to make it fruitful”. 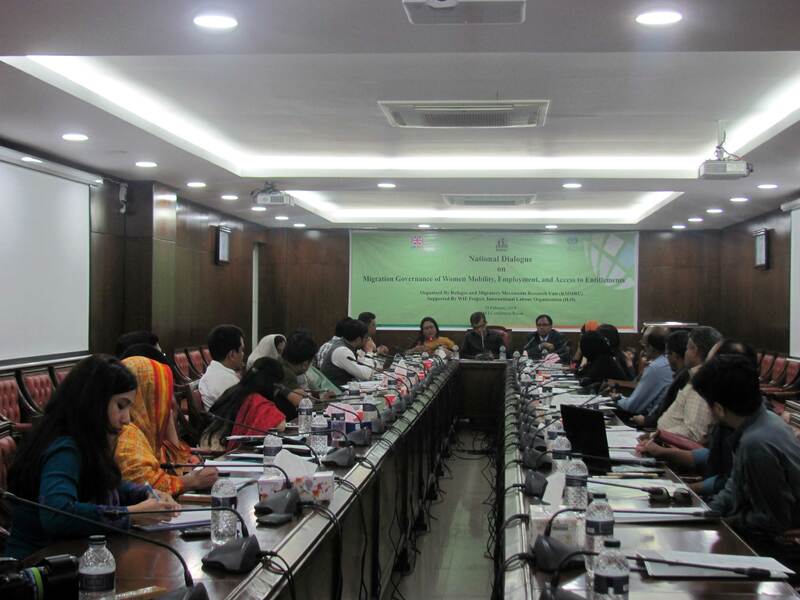 Overall, the consultation was filled with 52 participants representing BCSM and all relevant stakeholders in migration sector in Bangladesh. They contributed to generating a constructive dialogue on the implementation of GCM in the context of Bangladesh and set out to have a pragmatic global governance framework to address large movements of migrants and refugees across the globe, including Bangladesh. The Refugee and Migratory Movements Research Unit (RMMRU) has organized the National Dialogue with High Level Government Officials on Policies Addressing Labour and Mobility. Ms. Marina Sultana, Director, Programme, RMMRU, moderated the Dialogue. Mr. Md. Nazrul Islam, Full Time Member, National Human Rights Commission Bangladesh was present as Chief Guest. Additional Secretary of the Ministry of Social Welfare Mr. Rupan Kanti Shil addressed the function as the special guest. Speaking as the Chief Guest NHRC Fulltime Member Mr. Md. 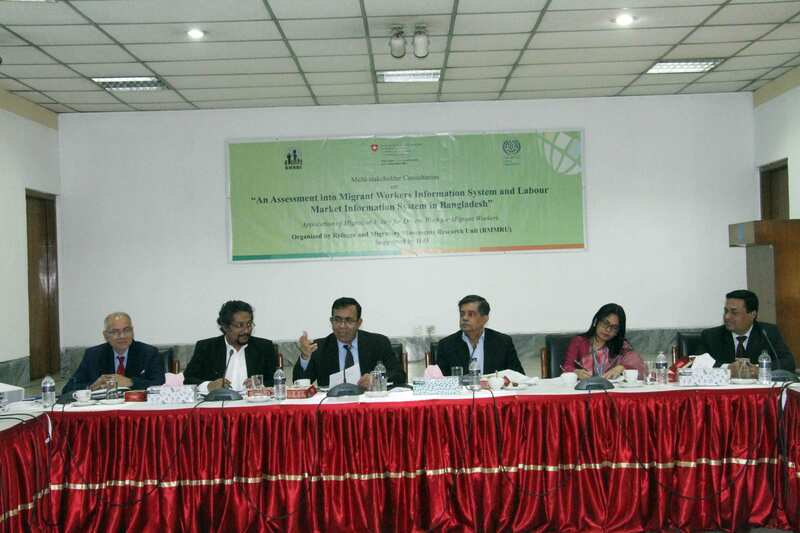 Nazrul Islam said that underpinned the need for conducting in-depth research by the government on migration to find out the challenges, opportunities and markets for the country's manpower sector. He also emphasized on supplying skilled manpower on the basis of demand of a particular labour markets. He urged the people to avail of the advantage of the Right to Information (RTI) Act-2009 to know the process of migration with overseas jobs for avoiding fraudulences by middlemen. Lawyer Jyotirmoy Barua lamented that a large number of bodies of migrant workers were being received every year, but the actual causes of their deaths were usually not known. He sought intervention of international organizations in this connection. Former Secretary General of the Bangladesh Association of International Recruiting Agencies Ali Haider Chowdhury said that the demand-based skills training should be introduced for women overseas jobseekers.’ Professions like care giving and nursing have a huge demand in different countries where the number of aged people is growing day by day,’ he said adding that Bangladesh should target such jobs for Bangladeshi women migrants. 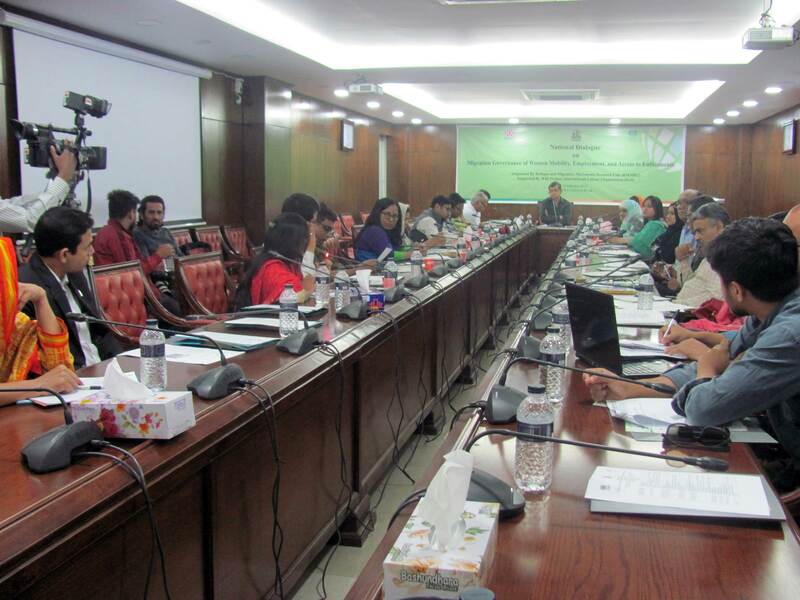 Ali Haider suggested that the Bangladesh government might focus on developing a dormitory system for domestic helps as the housemaids were more vulnerable to abuses in employers’ houses. Overall, the dialogue was filled with 50 participants representing all possible stakeholders relating to women and migration of Bangladesh. There had been civil society members who discussed over the topic in normative sense, there was NGO workers who are working on policies addressing Labour and Mobility, even government representative who are committed to safeguard the security of female migrant workers of Bangladesh. Conclusively, the dialogue was successful to engage all possible stakeholders and to omit the gap between knowledge on policies addressing Labour and Mobility. 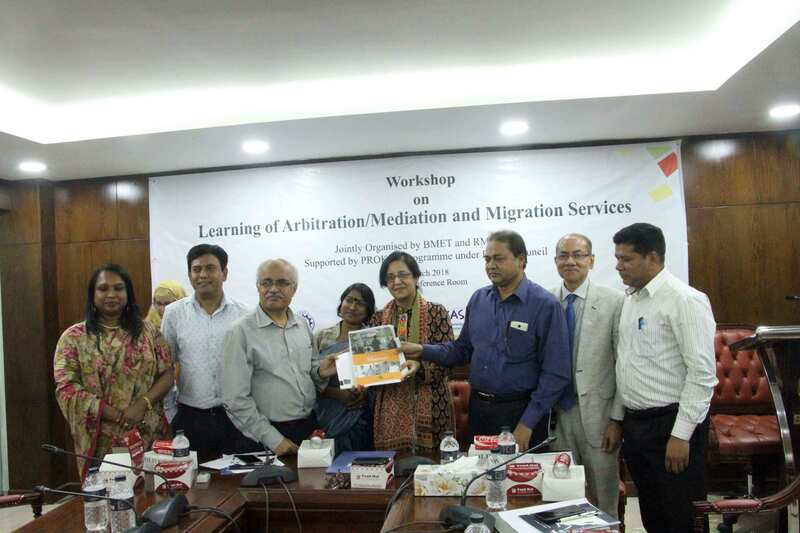 Refugee and Migratory Movements Research Unit (RMMRU) organized a joint workshop with BMET named “Workshop of Learning of Arbitration/ Mediation and Migration Services” held on 11 March 2018 at BMET Conference Room for sharing the process of mediation and mediation document to BMET. This was an initiative of sharing experiences of arbitration process of BMET as well as mediation system of RMMRU at the grassroots level to ensure application of the Migration Act, 2013. This programme was chaired by DR. Sumaiya Khair, chair of RMMRU Officials of Arbitration section of BMET and Ministry of MoEWOE were present there as participants. Director of employment, Mr. Ataur Rahman, Director training Mr. Nurul Islam and Mr. Atiur Rahaman, Director Immigration attended the programme as panel discussant. 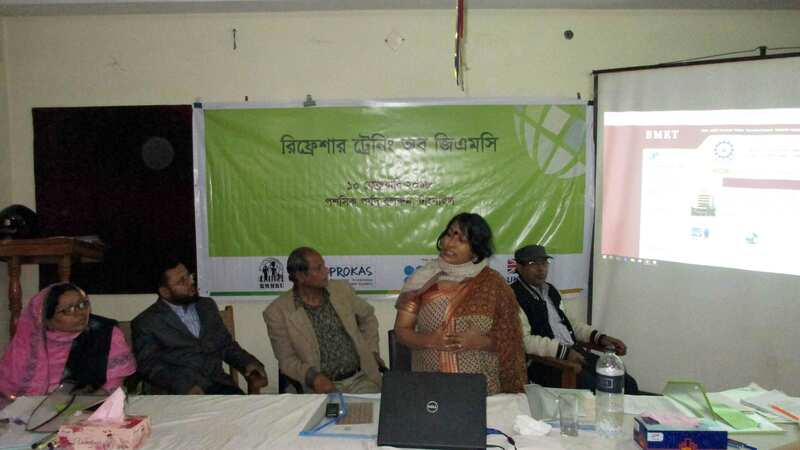 Dr. Jamila A. Chowdhury, Associate Professor, Department of Law, University of Dhaka shared about alternative dispute regulation and Mr. Masud Rana, Senior Statistics officer, BMET presented on Arbitration system of BMET. RMMRU showed the documentary on how RMMRU settles migration related disputes through mediation using the Grievance Management System. The video described the process of how the committees work from their respective positions in order to constitute mediation, the process of mediation, amicable solutions taken by the committee etc. The most important part of this programme was sharing of RMMRU’s Migration Manual titled “Migration Disputes Mediation Manual” with BMET directors and officials. The process of the mediation which is conducted by the GMS is highlighted in the manual with step by step with instruction. Dr. Jamila A. Chowdhury presented the importance of ADR in Migration sector, skills, and techniques to be followed by a mediator. Ms. Marina Sultana presented how RMMRU Practices migration Mediation at the grassroots level. She focused on ‘Three Stages’ of Migration. Dr. Sumiay Khair summarizes the mode of operation of the Grievance Management System on how it works regarding the mediation. 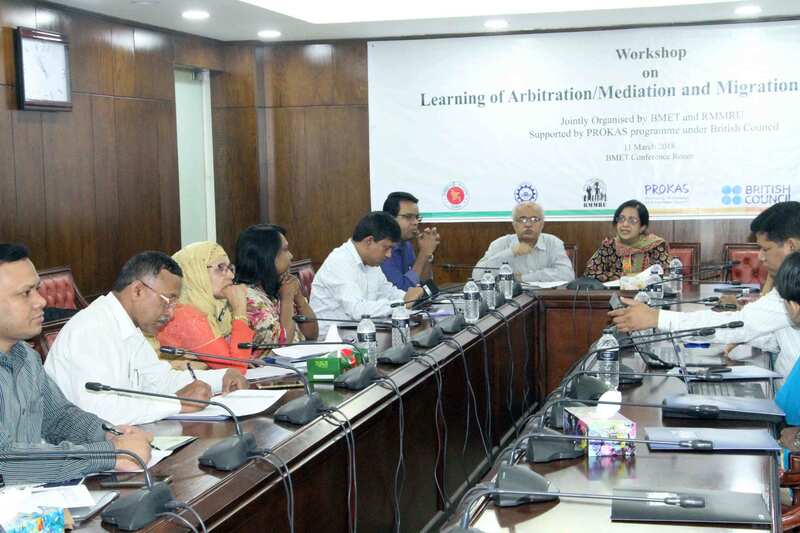 Dr. Nurul Islam, Director Training Operation, BMET said that “Mediation is widely accepted the process of ADR. RMMRU has taken this kind of initiative which is very much helpful to settle the case of migration fraudulence.” He also said that as most of the cases victim does have the proper documents so it becomes difficult to redress through formal case management. RMRMU practices mediation where the mediator practices win-win situation and both parties become satisfied with the decision. RMMRU maintains documents of mediation filing up different forms to make an institutionalized process of mediation. 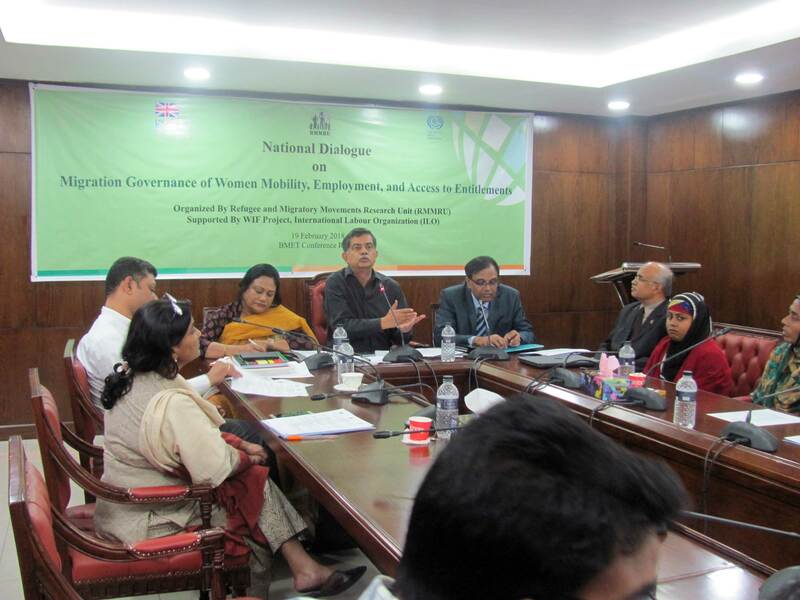 The Refugee and Migratory Movements Research Unit (RMMRU) has organized the National Dialogue on ‘Migration Governance of Women Mobility, Employment, and Access to Entitlements’. Dr. C R Abrar, Executive Director, RMMRU, moderated the Dialogue. Mr. Selim Reza, Director General, BMET was present as Chief Guest. Speaking as the Chief Guest BMET Director General Mr. Salim Reza called it a success for the government that it could make female workers’ migration free of cost. Dialogue moderator and Executive Director of RMMRU Dr. C R Abrar said that the migrant workers seldom get their legitimate arrears wages. Dr. C R Abrar, also said that the state-owned BTV should run campaigns to keep the migrant workers informed about the real picture about migration. Supreme Court Lawyer Jyotirmoy Barua stressed the need for proper enforcement of the Overseas Employment and Migration Act 2013. Labour leader Rokonuzzaman Ratan said that the government could create a fund with remittance money to assist deprived and abused migrant workers. Manusher Jonno Foundation Program Manager Ms. Sarwat Binte Islam asked the authorities to find out alternative job markets for female workers and stop sending them to the KSA from where many women workers returned home as victims of sexual abuse and non- payment of wages. Overall, the Dialogue was filled with 50 participants representing all possible stakeholders relating to women and migration of Bangladesh. There had been civil society members who discussed over the topic in the normative sense, there were NGO workers who are working to promote Migration Governance of Women Mobility, Employment, and Access to Entitlements, even government representative who are committed to safeguarding the security of female migrant workers of Bangladesh. Conclusively, the Dialogue was successful to engage all possible stakeholders and to omit the gap between knowledge of Migration Governance of Women Mobility and practical situation happening around. Refugee and Migratory Movements Research Unit (RMMRU) organized training on “Fresher Training of GMC” on 10 February 2017. The training programme took place at Poshoshik Porshod Hall Room, Tangail. All members of RMMRU Mediation Advisory Group, members of RMMRU Migration Mediation Committee (RMMC) and Youth Volunteer Group, affected migrants participated in this programme. 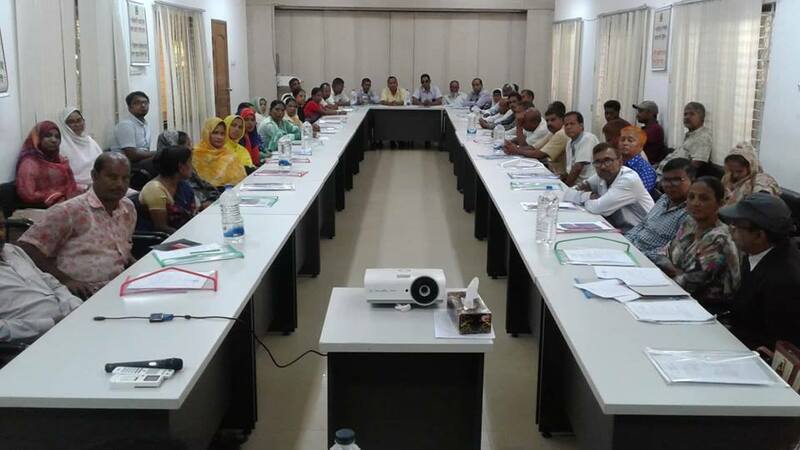 The sessions of the orientation were conducted by Mr. Assistant Commissioner, Tareen Moshrur, DC office, Tangail Tangail, Advocate Abu Raihan, Advocate Mohammad Humayun Kabir Tangail District Bar Association, Advocate Ms. Jahanara Begum, Tangail District Bar Association. Ms. Marina Sutana, Director, Programme moderated the training programme. 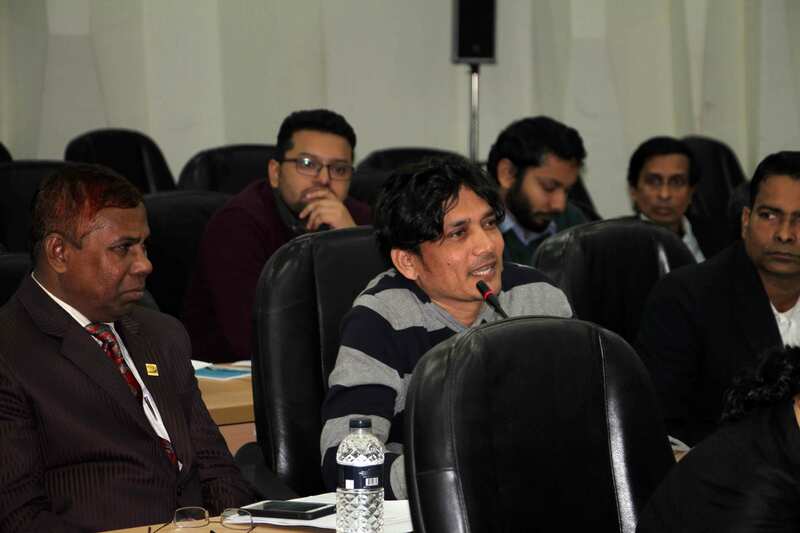 Refugee and Migratory Movements Research Unit (RMMRU) organized a pre-dissemination workshop on its second phase of the landmark panel-data research ‘Impact of Migration on Poverty and Local Development, IMPD’ on 31 January 2018 at CIRDAP Auditorium, Dhaka. 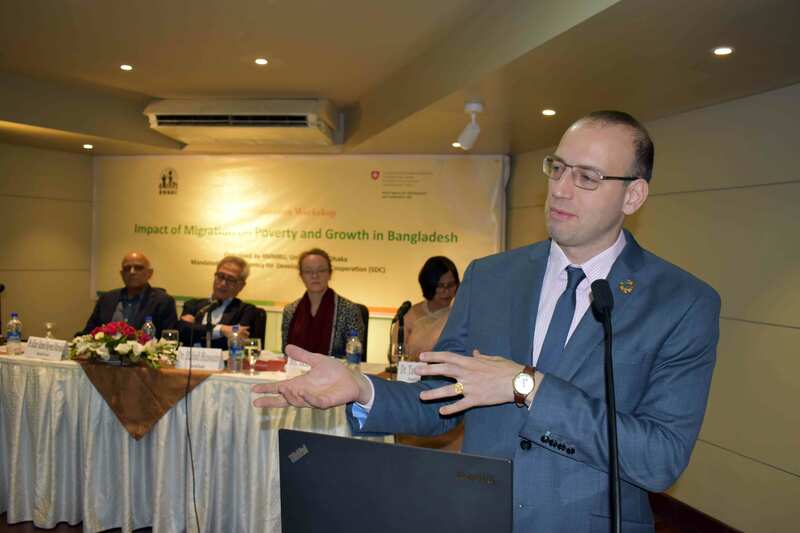 The Swiss Agency for Development and Cooperation (SDC), Bangladesh has supported both the first and the second round of the survey. The study was conducted by Professor Tasneem Siddiqui, Dr. Ananta Neelim, and Dr. Chowdhury Rashaad Shabab and coordinated by Mr. Mahmudol Hasan Rocky. The goal of the pre-dissemination workshop was to share the preliminary research findings with the lawmakers, economists, development experts and media with a view to receiving feedback on probable findings to be highlighted in the next publication. The programme was started with the Welcome address and the rationale of the workshop by Mrs. Marina Sultana, programme Director, RMMRU. 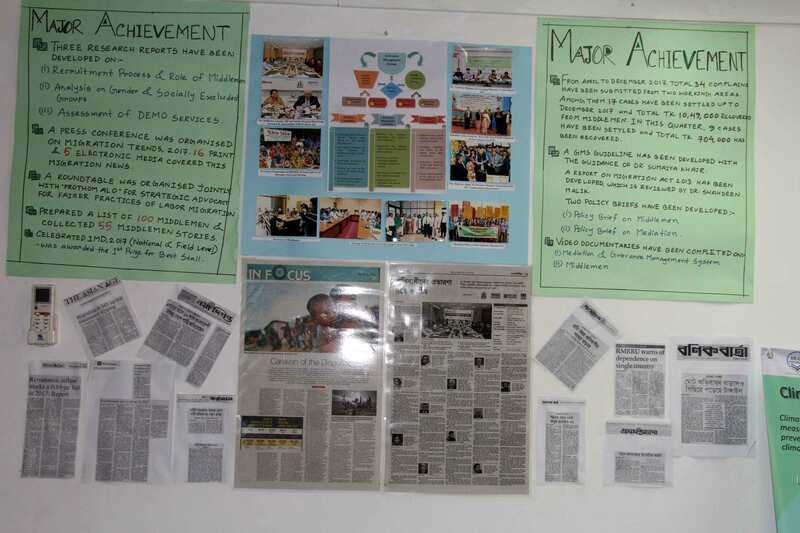 The photographs taken from twenty different study areas by the field enumerators were presented then. At this session, Lead researcher of IMPD and founding Chair of RMMRU, Professor Tasneem Siddiqui shared core findings before the guests. The State Minister for the Foreign Affairs Mr. Md. Shahriar Alam M.P. was the chief guest in the inaugural session. Honourable State Minister distributed certificates and prizes to the field enumerators in best photography, best enumeration, best supervision and best data entry categories. 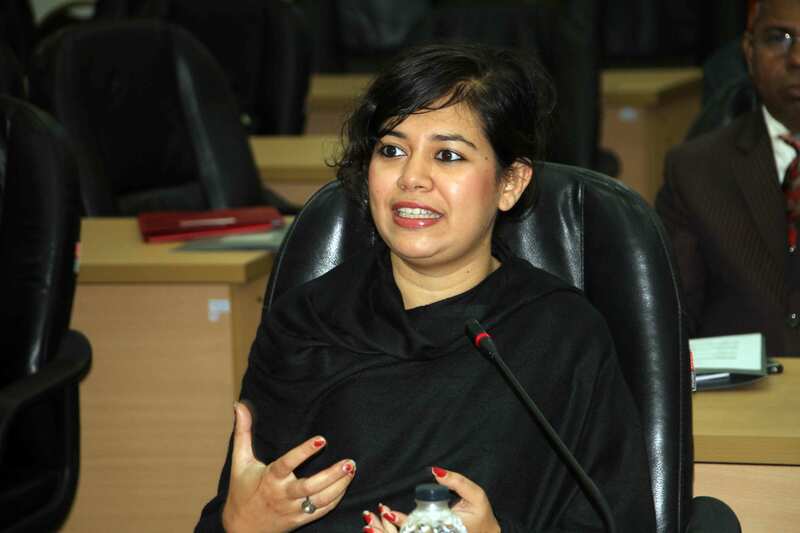 Ms. Nazia Haider, Senior Programme Officer represented SDC as a special guest. In the working session, Dr. Ananta Neelim presented the findings in detail before the audiences. Dr. Atiq Rahman Executive Director of BCAS, Dr. Abdur Rob Khan Dean, School of Humanities and Social Sciences (SHSS) North South University, Mr. Md. Dildar Hossain Project Director of BBS, Ms. Shahreen Munir National Programme Officer for Labour Mobility and Human Development, International Organization for Migration (IOM), Dr. Bazlul H. Khondker, Chairman of SANEM, Dr. Rashed Al Mahmud Titumir, Chairman, Unnayan Onneshan discussed as panelists at the workshop. French Ambassador to Bangladesh, H.E. Mrs. Marie-Annick Bourdin was also present at the programme along with distinguished guests to the pre-dissemination workshop and provided with valuable comments to the research outcomes. 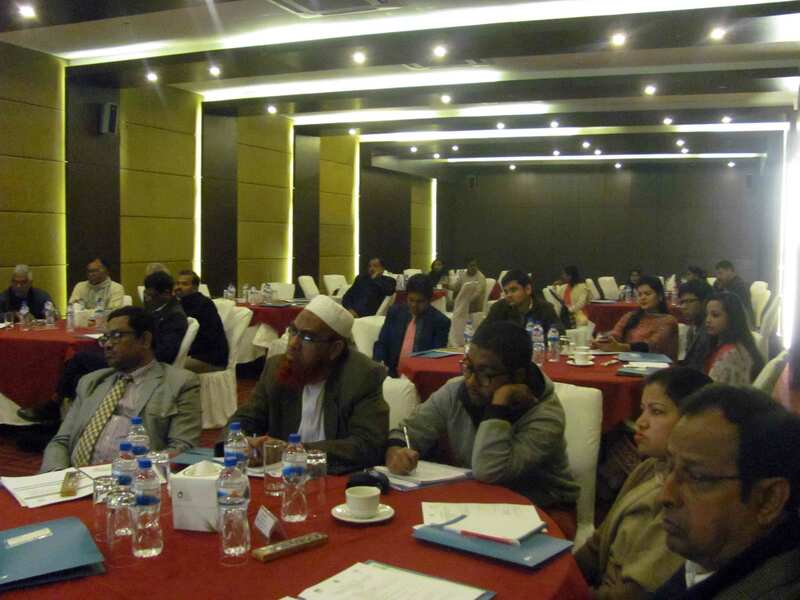 The validation workshop was arranged under the project: An Assessment into Migrant Workers Information System and Labour Market Information System in Bangladesh, supported by ILO. The consultation was chaired by Dr. C R Abrar, Executive Director, RMMRU. Mr. Md. Nazrul Islam, Member, Human Rights Commission (NHRC) was present as the Chief Guest of the program. After the welcome note by Dr. C R Abrar and address by Ms. Rahnuma Salam Khan, National Program Officer of ILO, study presentations were held by Mr. S N Azad, Senior Fellow, RMMRU. The first presentation was held on Data Gaps and Needs Study which mainly focus on the analysis the gap in data for a better understanding of the relevance and impact of any data gaps identified. The presentation was discovered data that are available, their strengths and limitations and what data are regarded as important but not available to answer essential development questions. After the presentation, the session supported discussions within and across agencies, organizations and communities on how to bridge data gaps and sustain data assets. The second presentation was presented by Md. Mazharul Islam, System Analyst, Daffodil IT and Team Member, MIS Data Integration Project, RMMRU. This presentation highlighted Data Integration Design of the project aimed at ensuring the most accurate collection of migrants and labor market information in a place which will help the government (and other migrants related stakeholders to help government) to make a better development policy according to the analysis and manage the migrants related tasks digitally. Other representatives from BRAC, DEMO, WEWB, IOM, Dnet, BEF, Daffodil IT, CPD, ASK, WARBE, and Dhaka University also attended the program. Overall, active participation by the representatives made the consolation very informative and productive. 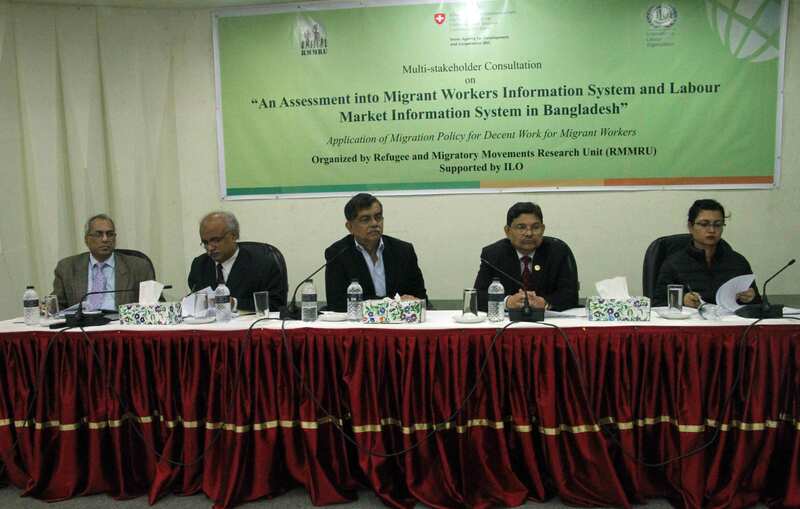 The first Multi-stakeholders’ consultation was successfully held from 9.30 am to 2:00 pm on 17 January, 2018 under the project: An Assessment into Migrant Workers Information System and Labour Market Information System in Bangladesh, supported by ILO. The consultation was chaired by Dr. C R Abrar, Executive Director, RMMRU. Mr. Md. Amir Hossain, Director General, Bangladesh Bureau of Statistics was present as the Chief Guest of the program. Also, Mr. Gazi Mohammad Julhash, DG, WEWB, and Mr. Nurul Islam, Director, BMET were present as Special Guest of the program. The keynote paper was presented by Mr. Deepa Bharathi, Chief Technical Advisor of ILO. Mr. S N Azad, Senior Fellow, RMMRU presented on Survey of Data and a Comparability Study. 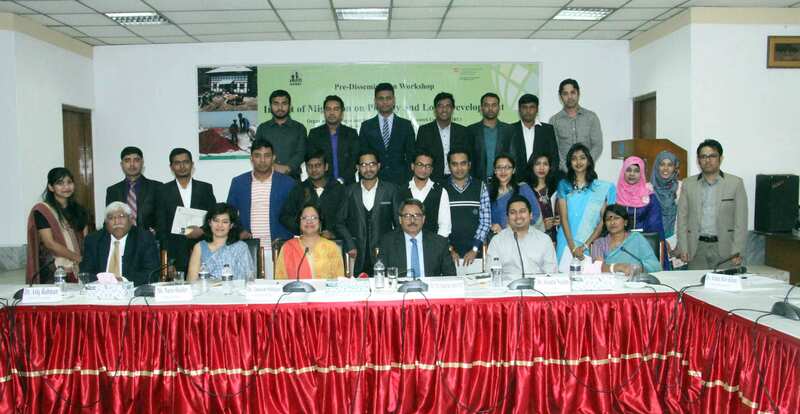 Other representatives from A2i, BGTTC, BRAC, World Bank, DEMO, IOM, SDC, Dnet, DYD, BEF, WARBE, BOMSA, YPSA, Daffodil IT, CPD, OKUP, ASK, Dhaka University, and Awaj Foundation also attended the program. The meeting started with welcome note and presentations. After that, representatives from different organizations actively participated in discussion. The first presentation was presented the comparability analysis of internal system with overseas database system in Sri-Lanka and Nepal. The next presentation focused on field survey and key findings from the survey. After both presentations, an active discussion was held and very significant comment and recommendation were come from the discussion. RMMRU and C3ER jointly organized the 4th Quarterly Reflection Workshop, two days long residential programme , on 10-11 January, 2018 , which was supported by PROKAS. 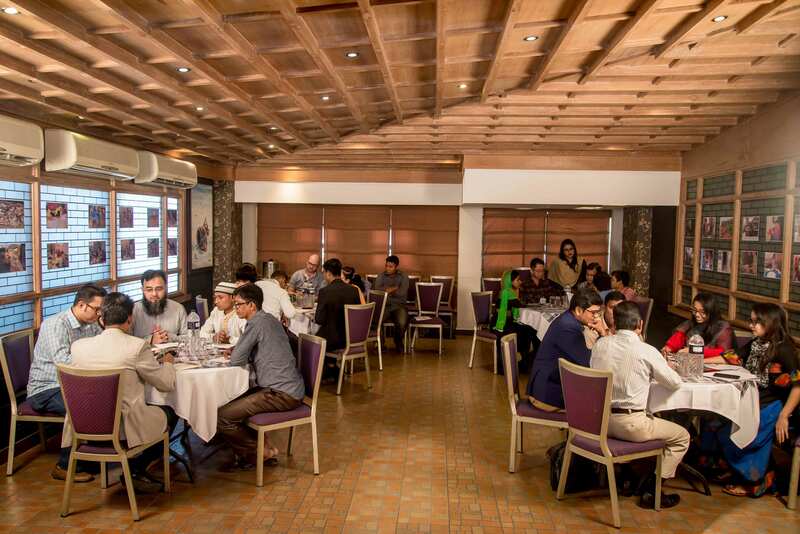 To provide a platform for IBP partner organizations a quarterly reflection workshop is organized to share their achievements, challenges and learning over the last three months and also discuss the ways forward with planned interventions. 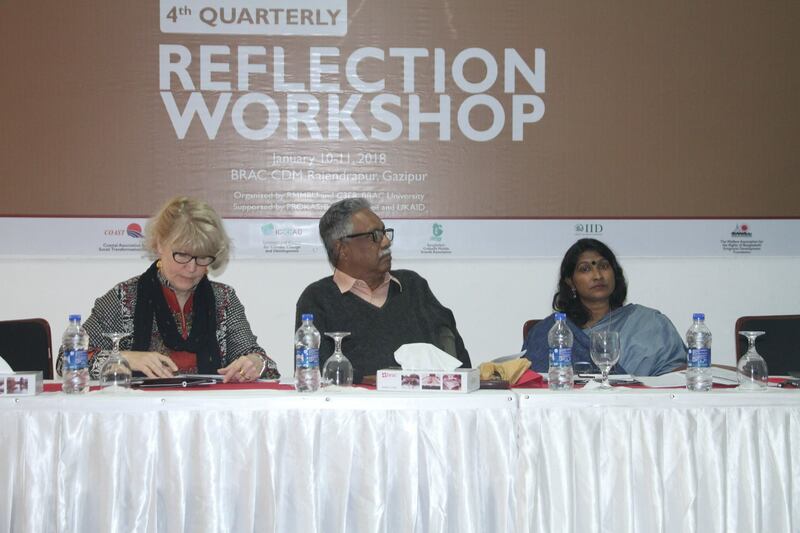 Dr. Ainun Nishat, Emeritus Professor, C3ER, BRAC University and Marina Sultana, Director Programme, from RMMRU welcomed everyone in the two days workshop. Ms. Catherine Cecile of PROKAS thanked RMMRU and C3ER to organize this programme. Hosne Ara Lutfa Dalia, MP, Member of Parliamentary CAUCAS and Dr Atiq Rahman, Executive Director of BCAS presented as the guest of the programme. The participant of the programme consists of 65 members from Climate Finance Transparency Mechanism (CFTM) project and the Fairer Labour Migration (FLM) Project. 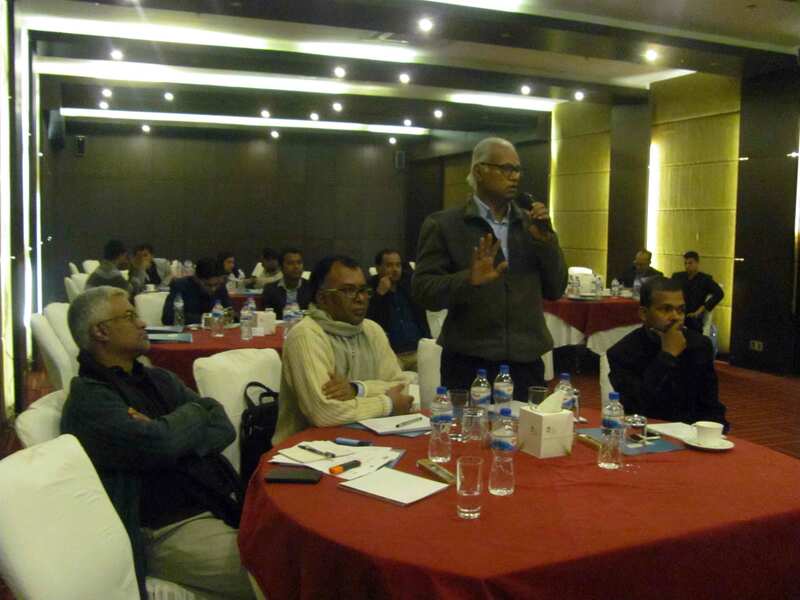 CFTM is being implemented by a Consortium of five organizations, consists of Bangladesh Centre for Advanced Studies (BCAS), Centre for Climate Change and Environmental Research (C3ER), COAST Trust, Campaign for Sustainable Rural Livelihoods (CSRL) and International Centre for Climate Change and Development (ICCCAD). 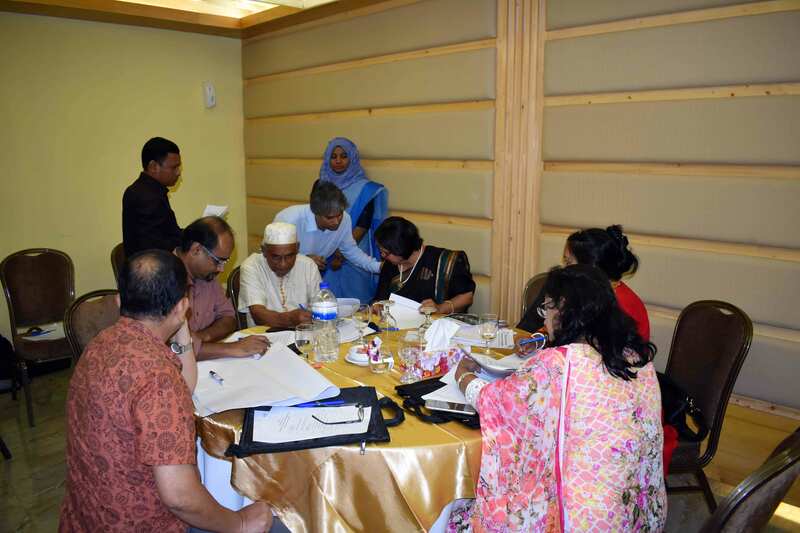 Whereas, the FLM consortium consists of Institute of Informatics and Development (IID), Young Power in Social Action (YPSA), WARBE Development Foundation, Bangladesh Ovhibashi Mohila Sramik Association (BOMSA), and Refugee and Migratory Movements Research Unit (RMMRU). In this programme all IBP partners shared their achievements of last quarter. Experts from Migration sector and Climate provide their opinion. 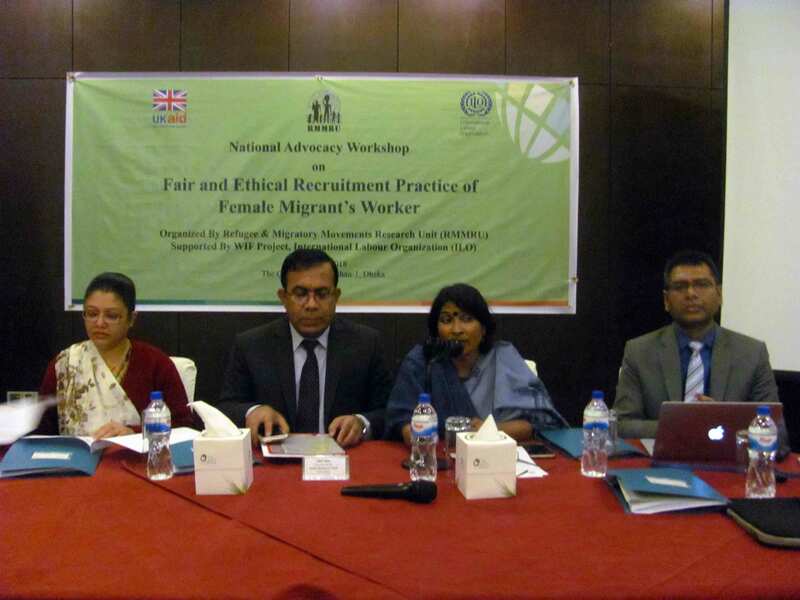 The Refugee and Migratory Movements Research Unit (RMMRU) has organized the National Advocacy Workshop on Fair and Ethical Recruitment Practice of Female Migrant Worker in collaboration with the International Labor Organization (ILO). Ms. Marina Sultana, Director, Program, RMMRU, moderated the workshop. The opening session was chaired by Dr. A.S.M Ali Ashraf, Adjunct Research Fellow RMMRU. Mr. Md. Nazrul Islam, Full time Member, National Human Rights Commission Bangladesh was present as chief guest. 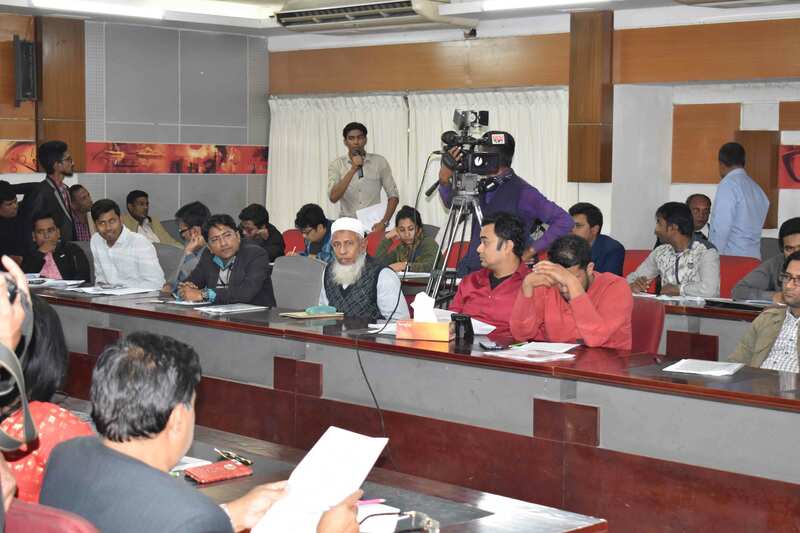 Present Scenario of Recruitment Practice and Legal Framework to Solve Problem: Dr. A.S.M Ali Ashraf has tried to throw light on the issue of how recruitment system works in Bangladesh at present time. He has pointed out some major problem regarding fair recruitment; female migrant workers are still paying subagents to facilitate their migration process when officially they do not need to pay money to the agents or subagents, sometimes female migrants are trafficked. Dr. Ashraf has also pointed out some normative approach to ensure that female migrant workers are recruited ethically. For example, he mentioned the Prevention and Suppression of Human Trafficking Act 2012 and Overseas Employment and Migration Act 2013. He urged to deal with fraudulent cases under the 2013 act and asked to promote awareness on the issue of fair and ethical recruitment at the grass root level. Unethical Recruitment: Practical Experience Sharing: Bithi Akhtar was a returnee migrant who had worked in Saudi Arabia in 2017 was present in the workshop to share her real life experiences in abroad as a domestic worker. She is originally from Khulna, happily married and has two children (one 3 years old another recently died). Insufficient economic condition compelled her to opt for migration in Saudi Arabia. She paid 25000 BDT to a subagent who managed her to migrate. She took six months training in housekeeping and was recruited in a Mega Company in Saudi Arabia. Her agent told that she will get at least 25000 BDT per month salary but when she migrated she was offered no salary for the first 6 months. After first half of a year when she asked her Kafil (recruiting company in Saudi Arabia) to pay money she was sold another house for 2 months. When she demanded her salary, she was again sold at another house. She told that she was physically tortured three times and fall trap of sexual harassment once. Even she was not allowed to talk to her family. I. Improving training quality for the female migrant workers. II. Increase training duration from 1 month to 6 months. III. Language problem should seriously be solved. IV. Making strong relationship between recruiting agencies with government agencies. V. Ensuring Migrants are taking their SMART-Card. VI. Search for alternative labor market. I. We should ensure our dignity first, otherwise we will lose our identity. II. Safe, secure and dignified work, otherwise stop migration. III. Returnee migrants should be offered with added rehabilitation facilities. Extended Load and Low Payment: Experience Shared by Jahida Begum: Miss Jahida Begum was one of those returnee migrants who were allured by subagents (DALAL) to migrate in Oman at the expense of 20000 BDT. Firs time she did not took any formal training of housekeeping nor had her contact paper prior to take flight for Amman. She stayed there for 1 year but she was not offered her promised salary. Dalal said she will get 20000 BDT but she got only 12000 BDT. Now she is intending to migrate in Saudi Arabia with a formal training from Bangladesh Korea Technical Training Center (BKTTC). This time she wants to migrate in Saudi because in that very country she can get salary of about 20000 BDT. Expert Comment 1: Ms. Rokeya Rafeque Executive Director, Kormojibi Nari: Migration is like the golden deer, we should never say no to migration because the way migration helped our economy is appreciable and praiseworthy, and this typical narrative was marked by the voice of Miss Rafaque. She recognized the short comings of migration but she exposed that every profession has it respective challenges; we better address the challenges to make it smooth. She said those who said women are not safe abroad; do they have any reason to explain how far women are safe in Bangladesh? Economic as well as family need actually enforcing women to expatriate, can you exemplify someone with economic sufficiency migrate? She encouraged organizing informed migration so that the migrants are aware of their upcoming challenges and can meet the challenges with courage and confidence. He reiterated the importance of migration to sustain economic independence of Bangladesh at the same time to empower women respectively. Miss. Rafeque advised the concerning authority to advertise safe, secure and informed migration. I. Civil society based monitoring in the host country. III. We need to upgrade the professional training for migrating women. Expert Comment: Asif Munier, Independent Consultant: Mr. Munier pointed some notes for women empowerment as (i) life skills (ii) training (iii) monitoring by the govt. and (iv) interactive tools of teaching. Being pessimistic he said ILO labor laws are only an idealistic tool which is groundless in many respect. We should regular FNF VISA to make fraudulence cases reduced. He recommended the present stakeholders to be realistic and to be specific to solve problems practically. Remark by the Guest of Honor: Mr. Gagan Rajbhandari Deputy Director and Officer in Charge, ILO, Country office for Bangladesh: Mr. Rajbhandari said that labor migration is challenging and the challenges are big in size but we need to address these challenges in such a way that can result in the extensive flow of labor migration in all over the world. People want information, and if potential migrants are endowed with all possible information they can save themselves from all possible harassments and maltreatment. I. There should be a committee on migrants’ worker’s rights especially for female migrants. II. Advertisement can help fair and ethical recruitments. III. Need improvement in training. VI. Home Ministry, Foreign Ministry and Human Rights commission should work hand in hand. VII. There must be a committee of civil society who will observe the work. VIII. Search for alternative jobs and job market is recommended.